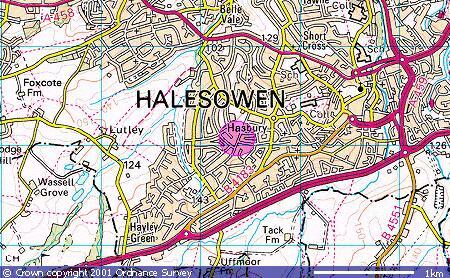 Halesowen lies 13km to the west of Birmingham city centre in the West Midlands of England. The weather station lies within a residential area 1km west of, and higher than, Halesowen town. This is in quite a hilly area on the local scale, with many minor hills and dips. More significant ranges of hills lie a few km to the N and E, stretching from Dudley through Rowley Regis to Quinton, and to the SW and S the 300m high Clent, Walton Hill and Romsley. The area is rather more exposed to the W and NW through the 'Cheshire gap', the only direction without significant hills in the way, so weather from that direction arrives here relatively unhindered. The 'Great Divide' is the strip of high ground on the right side of the map above (shown in grey) which runs north to south. Rain falling to the west of the 'Great Divide' ends up eventually in the Bristol Channel to the west of the UK, while rain falling to the east of the 'Great Divide' ends up in the North Sea to the east of the UK. If you know this area, the Divide follows Long Lane/ Narrow Lane at the top of Mucklow Hill. Rainwater from Halesowen town centre and from my own location, being just to the west of the 'Great Divide', drains into the Upper Stour valley, the R. Stour and its tributaries into the R. Severn at Stourport, finally into the sea through the Bristol Channel. Rainwater from the higher eastern part of Halesowen and Quinton is to the east of the 'Great Divide' so drains to the east, finally arriving in the North Sea.. The soil here is mostly heavy clay, and the ground tends to retain moisture. Microsoft Access database. Manual Observations are keyed in. which holds Halesowen records from 1956 to the present. Further processing can then be performed, e.g. monthly and annual summaries, comparing recent weather with that of previous years, and identifying longer term trends. and can export results into Excel for further analysis and plotting graphs. Monthly data is uploaded to this website at the end of each month, and annual summaries at the end of each year. Long term records are also updated at the end of each year. A Monthly summary is submitted to Climatological Observers Link . Data from 2005 is my own, recorded at my own location. Data from 1956 to 2004 was sourced from a previous nearby weather station in Halesowen which had been run by Cedric Roberts MBE. More about Cedric and a selection of his own summaries can be found here. I have integrated some of his data from spreadsheet form into my own Integrated Database to provide a continuous series of records from 1956 to the present.